We’ve been together for a year and a half. My boyfriend is very calculating, and motivated about his personal and career goals. Yet, when I ask about his plans for us, he has none. He just says we have a future together. I would like us to work towards an engagement, but he won’t commit. He says he’s not ready. What can I do? I can’t help to feel rejected. Although we have our own homes, we practically live together because he’s either at my place, or me at his. I am the more emotional, affectionate, a romantic in our relationship. He is more of a loner, independent and less affectionate. But we’ve managed to make it thus far with our very different behaviors. We are truly opposites. My question is, I feel as though our relationship is not progressing, he doesn’t speak of our future together specifically. I think it’s fear, his parents divorced recently after 35 years of marriage. Not to mention alot of his friends are unhappily married. When I attempt to discuss this issue further, he becomes very distant, quiet, and doesn’t elaborate on his comments to my questions. Basically, provides me with yes and no answers. We already act as “we” and speak in “we”, yet he won’t take those extra steps to move towards our future. (1) Leave the topic alone for a set period of time and then check in after that time has elapsed to see where he is at. (2) Attempt to increase verbal communication and your depth of understanding about where he is at right now, and where you are at with it right now. (3) Raise the stakes and put some increased pressure on the topic, perhaps even issuing an ultimatum. However you start the period of time, with announcements or not, you must then stick to your end of the bargain and leave the topic behind for that period of time. This includes putting a self-stop on dwelling on it inside your head or re-visiting the familiar sense of insecurity in your emotional realm. Just let it all go for the period of time and let all the pressure off both you and him for that time. The key behind-the-scenes advantage of this approach would be that it would remove (for the set time period) those factors in the relationship that may be accentuating yours and his differences around this issue. Right now the two of you are in a kind of polarity dance over the issue. And the way you are dealing with the polarity is only likely to increase it. (2) Attempt to increase communication and depth of understanding about where he is at right now, and where you are at with it right now. This approach would be more active and challenging, perhaps more risky in the short run, but more rewarding if you can co-create some forward movement. Before you do it, you have to create a framework for increasing communication. You have to address issues of safety, because what basically holds him back from communicating is fear. He probably does not even directly experience it emotionally. But he ends up talking and acting like a deer caught in the headlights. Extending the deer in the headlights analogy, first know that there are three reactions to fearful stimuli (like your demands to know where he is at). Fight — Flight — or Freeze. This is a classical reaction pattern to physical danger, only here it is coming up emotionally around the topic of commitment and the M-word (marriage). It feels the same, anyway. He is at the freeze reaction stage. You have not yet boosted your demands to an ultimatum level, which risks the flight reaction stage. So there is he, frozen, with his vast planning and verbal skills reduced to simple grunts and “yes” “no” responses. Behind that? FEAR IS RUNNING. He’s a deer being rapidly closed in by a very dangerous vehicle. The only remedy is to slowdown the vehicle coming at him (your requests for information) to a virtual standstill, turn down the intensity of the headlights (your emotional pitch as it gets reflected in your voice tone parameters) and give him all the space and room to feel more confident that you aren’t just going to run him over. Make it safe for the two of you to gently explore this issue and gradually and slowly open up about it. This means zero judgment, zero name-calling, zero “I need you to take care of my feelings and insecurity about this” and so forth. In short, it calls for non-polarizing, safety-making, trust-building, communication gap-bridging skills on your part. Beyond this, it is important to set a framework in the relationship itself for why you would be motivated to face and deal with emotionally challenging issues like this. This builds a solid shared vision that strengthens each partners ability to work with polarities, upsets, fears and challenges. A shared vision that inspired personal growth and the continued growth of love and trust in a relationship. Often when I work with couples, taking them through the process of creating a shared vision will instill more confidence in each partner that they can take more risks and talk about things more deeply. It makes facing such challenges more personally compelling and meaningful. And it adds a deeper degree of irreplaceable emotional intimacy into the relationship. That would be a minimal level ultimatum that was geared around the goal of getting him more involved in communicating. 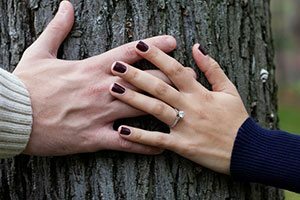 You could increase the goal to include other incremental elements, such as: reading books about relationship issues and how to deal with them, getting some counseling as individuals around this issue, getting some counseling together around this issue, getting engaged, getting married by such-and-such a date. Notice as you go up the scale in ultimatum, you are rapidly turning up the heat and taking a larger and larger risk that this deer will bolt from the relationship. So these are the three basic approaches you could take right now. There may be some blends that use elements of one or the other, as I have indicated, or even all three. It is up to you to choose what you are comfortable with doing at this time, balancing the risk factor with your own level of emotional need. Whatever your choice as to an action plan, you want to optimize your presentation to insure the best chances of getting the successful response you want.